Today I am celebrating zucchini, this vegetable that is quite considered ordinary, with not a lot of character. It’s its day of glory (son jour de gloire) and it’s well deserved. By dressing it up a bit, you can make delightful little meals with it. Zucchini is naturally bland, so like any other bland ingredient, it absorbs the flavor of whatever you are combining it with. I love the simplicity of this dish, yet with character. Thinking about it, I love simple things with character and that is true for people I like in general too. In my opinion is if you add too many powerful ingredients to a dish, it tends to lose the true nature of its key ingredient, then it’s confusion for your palate. 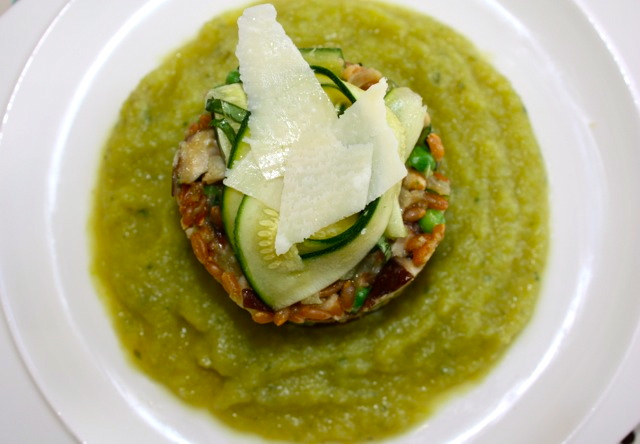 The interesting part of this dish is that you have cooked zucchini in small pieces in the farro, then puree zucchini which has such a velvety texture, then raw and marinated zucchini for a more crunchy bite. I love all the contrasts you get with these three kinds of preparations. As far as farro is concerned, I used Italian farro instead of the domestic one. I find it easier to cook, and it remains a little softer. You can substitute barley to farro. If you want to keep it vegan, don’t add the parmesan. Cook zucchini in vegetable broth until tender. Add thyme and cook for an extra 5 minutes. Adjust with salt and pepper. Blend in mixer and add more broth if it’s too thick. Using a potato peeler, form stripes going from one end of the zucchini to the other end. Place in a bowl and add olive oil, lemon juice and basil. Marinate for about one hour. When ready to use, add salt and pepper. 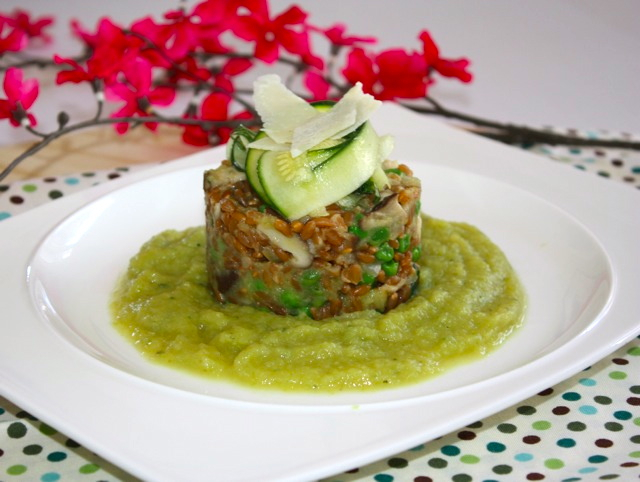 Cook farro in vegetable broth until cooked. Drain and set aside. Heat olive oil in a pan. Add shallots and onions and let cook a few minutes until fragrant. 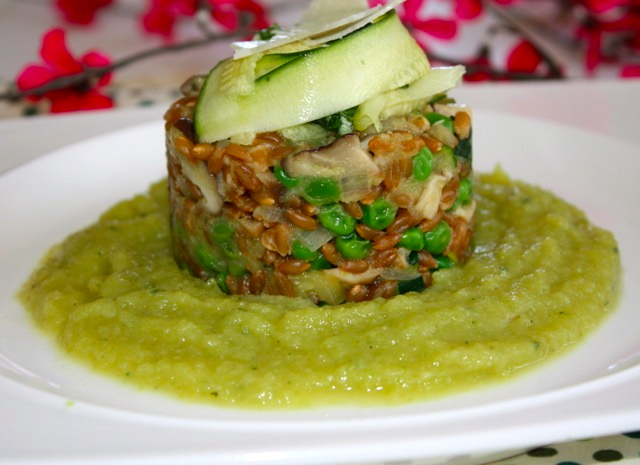 Add zucchini, mushrooms and peas. Adjust with salt and pepper. Cover with lid and cook until the vegetables are soft. Add farro to the vegetable mixture. Cook for about 5 minutes. Add 2-3 tbs of cream of zucchini, mix well and keep warm. In a plate, using a rind, place some cream of zucchini first around the rind. Then add a few tbs of farro in the rind. Pressing so that the shape does not collapse. Add zucchini ribbons on top with shaved parmesan. This entry was posted by silvia on May 27, 2016 at 12:25 am, and is filed under Grains, Vegan, Vegetables, Vegetarian - dairy. Follow any responses to this post through RSS 2.0.You can leave a response or trackback from your own site.